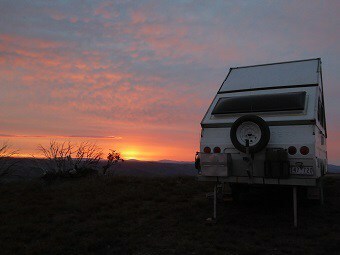 Where can you take your A-van camper that no one else has taken one before? The Blue Rag Range seemed a good choice. 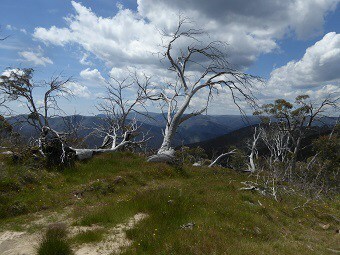 Blue rag is one of those iconic tracks, fairly steep and with fantastic 360 degree views. It’s a track that any serious 4x4 owner wants to do. When we drove the Blue rag in November 2014 there was a couple camping in a roof top tent on a patrol, they explained that they were doing sunset and sunrise on the blue rag. My brother-in-law Michael thought this was a great idea, with the addition of our A-Vans so we could camp in comfort. Michael has one of the new Adventure packs with extra ground clearance and coil suspension. Mine is a very modified A-Van with landcruiser 70 series leaf spring suspension. Michael’s truck is a Patrol complete with F&R diff locks and extra low low range. My truck is a Pajero, rear diff lock and smarts modified so I can have traction control on or off whenever I want. 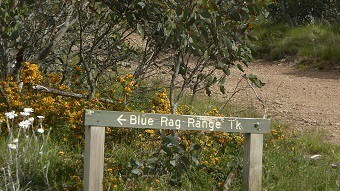 The Blue Rag seemed like a good idea, and a nice challenge, perhaps a bit too much of a challenge as the track is rated as black, and follows a ridge line with a drop on either side at the top and falling off the side of a mountain with a camper van on the back was not so appealing. We were a just little apprehensive. 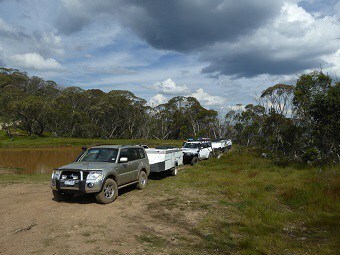 Anyway with the track recently graded and with the right gear towing the campers we thought that it would be do-able, wed might even get to play with the winches. A year went by, and we couldn’t find the time to return. 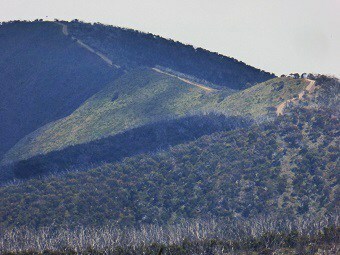 In November 2016 we were all set to go, when we found out the Dargo High Plains road was closed, , the December trip also failed to happen. One last weekend was available for the season, 7th January 2017. Viv and I let Michael and Narelle know we were going to be camping in the Bright area that weekend and if they wanted to come we would make the effort to do the Blue Rag. Friday came and Michael called me “where are you” he asked, “Still at home I replied, not going, too hot.” (38 degrees in Bendigo). Some discussion later we had determined that because of the elevation (1700m) the weather on the track would be quite pleasant. Winds would be light, so fire danger would be low. So off we set. We had not tackled anything this steep with the campers behind before, so visions of being pushed down a shaly slope by a runaway camper or sliding backwards and jack-knifing the trailer were pretty real. The thought of how far you would roll off the edge if it all went wrong added to the anticipation. It wasn’t my goal to be a subject of a viral youtube video of how not to do it. Various strategies were discussed and eventually we agreed on a sensible strategy, we would drive the Pajero up on 2WD without the van, and see how far we got. To make it a real test I also turned off the traction control, so open diff, 2WD. The only concession to the track was tyres at 22psi, as higher pressure would have been asking for tyre damage. I unhooked the van and all 4 of us set off up the track. The track was in a lot worse condition than when we last saw it. Up the first hill we drove, no problem, down the other side was more of an issue, with no ABS loose shale and 2WD made for interesting travel, anyway the Pajero handled it all just fine, until that last shaley climb to the top. 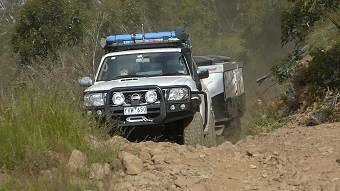 A bit of wheel spin, and we were at the top, all in 2WD! That gave us confidence. All that weas left was the return trip to collect the A-vans. The girls were: “What you want us to travel back along that and then get shaken up again coming back with the van behind?” NOT on! So the girls sat down in the grass and enjoyed the view, much to the confusion of other people on the track, who couldn’t understand how two ladies happened to be passing the time of the day at the top of a remote hill with no car in sight. Towing the vans up was surprisingly straight forward. A few scrapes on the washouts, and a bit of a scramble to get up that final steep slope. I took some one handed video on the way up and as technically bad as it is, it does show the real nature of the track. Michael didn’t even need to engage the diff locks. 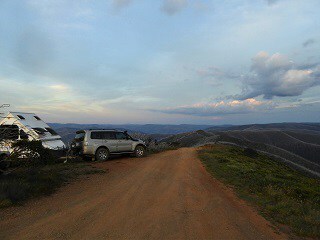 We set up camp at the summit, Michael got the prime spot, on the edge with a spectacular easterly view. Our camp was nice, but we were envious. We took lots of photos of the spectacular sunset and views, and had a nice meal, toasting the occasion with the fine crystal glasses we scored at the Bright op-shop for $1 each. We retired for the night setting the alarm for 5:30 to catch the sunrise. My fears of a heat wave were certainly wrong; in fact the evening was quite cold, as the rest of the state sweltered through a hot night, we rugged up in the face of a chilling westerly wind. By about midnight that chilling wind was blowing a gale. Sleep was very much interrupted as the gusts shook the van, fortunately the back of the van was to the wind, so although shaken all was stable. We woke at 5:30 to find that Michael and Narelle were already packed up, apparently it hadn’t been a good night with their van side on to the wind at the edge of a very steep slope. They did look rather worse for wear. 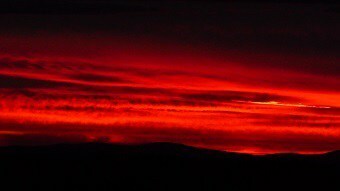 Any way the sunrise was worth it with a 180 degree red display. Not much point hanging around in the wind so we packed up quickly and set off down the hill. This was akin to driving off the edge of a cliff, as the track just disappeared below the bonnet, and the next thing you saw wsas a very steep decline. I had always wondered how effective the caravan brakes were, and I can report that they are very effective on steep slopes. One spot caused a few hassles on the return as I got a bit cross locked on a rocky jump up lifting a front wheel, having the smarts turned off at that point I lost the front traction, so it was touch and go for a moment, after that all was easy. 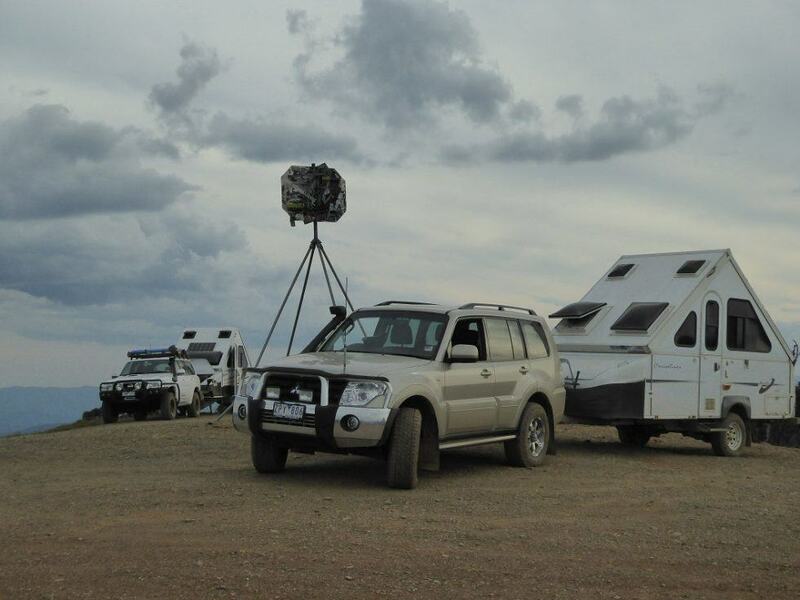 The experience has given us a lot of confidence as now 1. we have a way of testing if we can get the vans into a camp, (2WD test) and 2. we have the experience and know what to expect. So cross that one off the bucket list: Sunset to sunrise on top of Blue rag in the A-Vans. Question is: After the Blue Rag what is going to be the next trip?